While traction, physical therapy, and manipulation may reduce disc pressures to as low as 40 mm Hg, only spinal decompression has been shown to achieve negative pressures within the spine. It has been clinically proven that spinal decompression creates negative pressures as low as -110 mm Hg3 within the injured disc during the treatment session. Normally, pulls exerted on the spine trigger sensory receptors in the back to tighten the muscles surrounding the vertebrae and discs in an effort to protect them from injury. 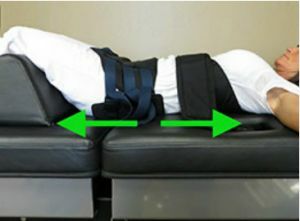 Spinal Decompression bypasses this response by slowly pulling on the spine and relaxing the back over an extended period of time, allowing the spine to be re-positioned without tension and without causing spasm and muscle guarding. It is important for patients to make sure that they are treated on a high quality true spinal decompression table by a physician with years of experience and not an imitation spinal decompression table. Sciatica can be caused by many things, so finding the right diagnosis is extremely important. A comprehensive spinal and neurological exam, as well as diagnostic studies, will help establish the cause of your pain. Contact our office to schedule an initial consultation to determine if your clinical case is suitable for the spinal decompression therapy. You may also bring recent copies of x-rays or MRI films or reports to help evaluate your case. After answering any questions you may have about the recommended plan, you may begin your case. View our testimonials or contact us today with a time and date that are convenient for you. We’ll find out the “why” behind your problem and how to solve it – then coach you to better health!